We (i) study bacterial signal transduction (nucleotide second messengers; photosensory transduction) and (ii) engineer synthetic light-regulated proteins and gene circuits for optogenetic applications. We use various bacterial systems and experimental approaches: synthetic biology, genetics, protein-ligand biochemistry, photochemistry, structural biology, metabolic engineering, bioinformatics, transcriptomics. C-di-GMP is one of the most common bacterial second messengers. It plays a central role in bacterial transition from the motile, single-cellular lifestyle to the sessile, surface-attached, multicellular lifestyle. Surface-attached bacteria form biofilms, communities of cells growing in the self-produced extracellular matrices. The majority of chronic infections involve bacterial pathogens growing in biofilms, where cells are much less susceptible to antibiotics. 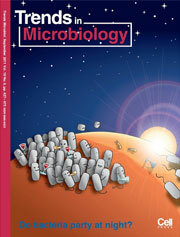 Therefore, understanding how biofilms are formed and destroyed is of significant medical importance. Current foci of c-di-GMP research involve (i) elucidating molecular mechanisms through which c-di-GMP operates in E. coli and in the intracellular pathogen Listeria monocytogenes, and (ii) using c-di-GMP to control activities of engineered proteins in animals. We also collaborate with several groups worldwide on c-di-GMP signaling mechanisms in diverse bacterial species. Fig. 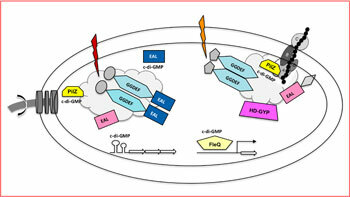 1. c-di-GMP-dependent signaling pathways in a hypothetical cell affecting flagellum, exopolysaccharide synthesis, and gene expression. Clouds represents local c-di-GMP gradients. Fig. 2. Overview of the enzymes involved in c-di-GMP synthesis and degradation and c-di-GMP receptors. 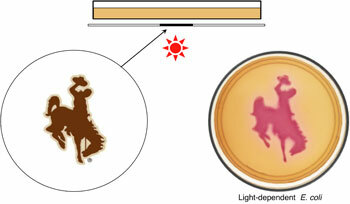 Near-infrared light-activated proteins have the potential to revolutionize biomedical research. These proteins can be delivered into model organisms (optogenetics) to control various activities in vivo with the spatiotemporal precision that supersedes that of chemicals (drugs). Near-infrared light penetrates mammalian tissues to the depths of several centimeters. 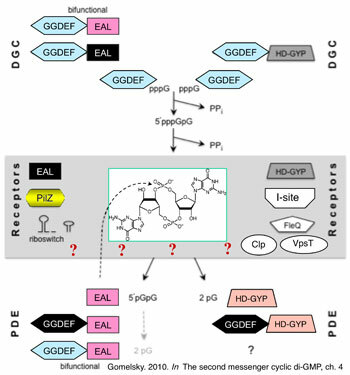 We engineered light-activated enzymes that control synthesis and degradation of nucleotide second messenger (e.g., c-di-GMP, cAMP). Using these enzymes, we are building synthetic signaling pathways for remote photocontrol of biological processes. Fig. 3. 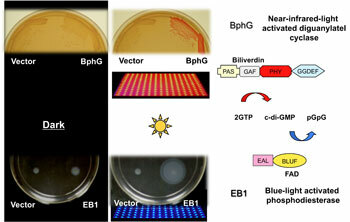 Engineered light-controlled bacterial behavior in E. coli (biofilm formation and motility). Fig. 4. 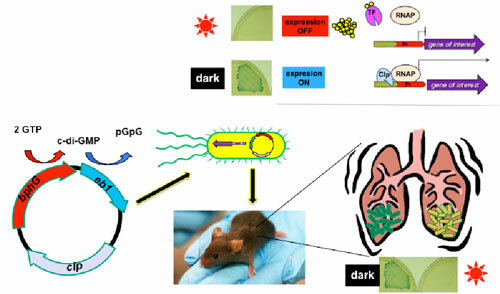 Engineered light-activated gene expression. Fig. 5. 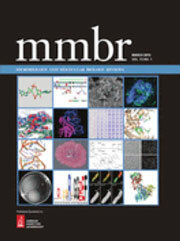 Remote control of gene expression in bacterial pathogens in murine models of diseases. Anoxygenic phototrophic bacteria are incredibly metabolically versatile. They can utilize solar energy and organic waste products to synthesize hydrogen and liquid biofuels. We use metabolic maps, flux balance analysis and reconstructed global gene regulatory systems of a model bacterium Rhodobacter sphaeroides to engineer biofuel producing strains. Fig. 6. 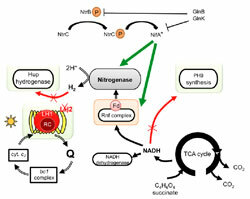 Phototrophic production of hydrogen gas by metabolically engineered R. sphaeroides. 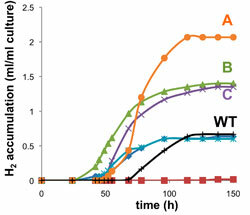 Left panel, hydrogen accumulation in various constructed mutants (A-C) compared to the wild-type strain (WT). 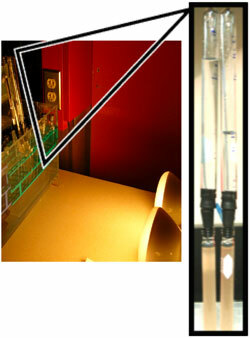 Right panel, experimental setup; hydrogen produced by bacteria pushes water out and accumulates in the inverted tubes.